It was raining flowers on a gloomy Monday afternoon (Sep 10) at Toa Payoh Sensory Park. Stomper Lau Lup was making his way back to work from lunch at about 12pm when he spotted the flowers falling from a tree. The scene reminded him of falling cherry blossoms and he stopped to admire and film it. “There were two ladies sitting and eating. They were also admiring the scene," he added. Opened in 2009, Toa Payoh Sensory Park is the first sensory public park in Singapore. 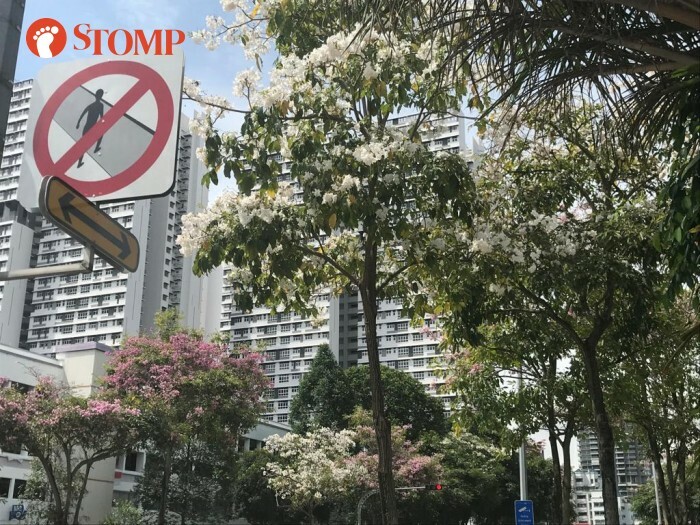 Similarly, Stomper Jey spotted the same flowers scattered across a field in Little India, at the junction of Clive Street and Dickson Road, on the same day. Lau Lup informed Stomp that he came across a similar sight near Boon Keng MRT Station on Tuesday (Sep 11). These flowers are from Trumpet trees and are trumpet-shaped, thus their name. According to NParks, this is the time of the year when they are blooming.